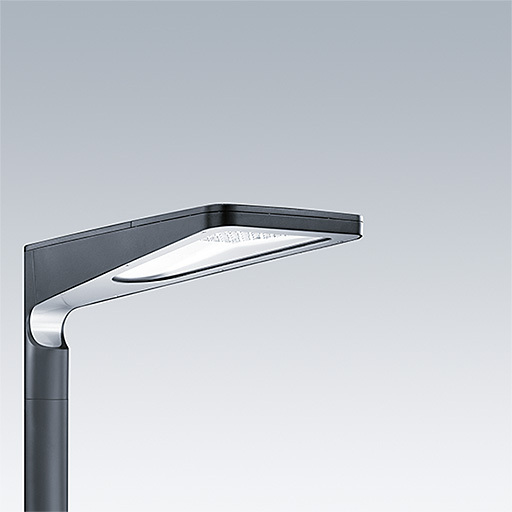 A small size LED urban street lighting lantern with 12 LEDs driven at 700mA with Wide Street & Comfort optic. Electronic, fixed output control gear. Class II electrical, IP66, IK09. Body: die-cast aluminium, textured dark grey. Cover: tempered flat glass. Pre-wired with 8m cable. Post top mounting to Ø60mm column. Integral power reduction function which dims down to 50% power, effective 3 hours before and 5 hours after a calculated midnight. Complete with 3000K LED.